Canadian Heritage Minister Melanie Joly hosted a public meeting in Montreal last week as part of her consultation on Canadian content in the digital world. The media reports from the event included a focus on comments from musician Patrick Watson, who is quoted as saying that no one would be on the Internet if there were no movies, television or music. Reports indicate that the comment generated support in the room and from Joly. 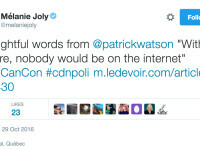 In fact, hours later, Joly tweeted out “thoughtful words from @patrickwatson ‘without culture, nobody would be on the Internet'”. If that really represents Minister Joly’s worldview on the Internet, there should be little doubt that an Internet tax will play a key role in her future plans. Claims that no one would be on the Internet without culture is demonstrably false, but it is consistent with the argument that Internet service providers and Internet companies owe their revenues to the cultural content accessed by subscribers and they should therefore be required to contribute to the system much like broadcasters and broadcast distributors. International Trade Minister Chrystia Freeland has faced a challenging week given the possible collapse of the trade agreement between Canada and the European Union. 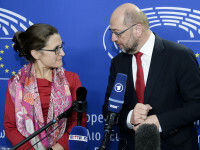 Freeland and the Liberal government have worked hard to get CETA to the finish line with some changes to the investor – state dispute settlement rules (the rules should be dropped altogether) and frequent travel across Europe to garner support for the deal. Back at home, the reaction to the CETA problems from the Conservative opposition has been embarrassing. Trade critic Gerry Ritz criticized Freeland, speaking of the need for adult supervision and calling on the government to get the job done. 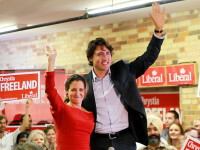 Freeland rightly called him out on the comments, but she could have also noted that the record suggests that it is the Conservatives that failed to get the job done on CETA. In April 2010, the Conservative government said it would be finished in 2011. In 2011, reports said it would be done in 2012. In October 2012, the projection was a deal by year-end. It took until the fall of 2013 for a ceremony marking an “agreement-in-principle”. 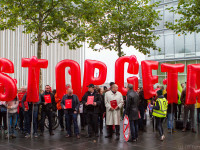 That too proved to be premature as there was another event celebrating an official draft in 2014 followed by more legal drafting and the renegotiation of controversial ISDS provisions that led to the release of another text earlier this year. In other words, Freeland inherited far less than advertised on CETA and the Conservatives might not want to remind the public that their biggest trade accomplishment never actually involved a signed, final text. The Ritz remarks have attracted attention, but comments yesterday from Prime Minister Justin Trudeau may have a longer and more damaging impact on Freeland. The prospect of new digital taxes and regulation to fund the creation of Canadian content continues to attract attention with cultural groups leading the charge. For example, the Canadian Independent Music Association recently called for the regulation of digital services and ISPs including mandated contributions to support the development of Canadian content, while ADISQ has previously lobbied for a similar policy approach. With mounting coverage of the issue, Canadian Heritage Minister Melanie Joly appeared last weekend on CTV’s Question Period, spending most of the nine minutes dodging questions from host Evan Solomon. Joly started by clearly stating that “there will be no new Netflix tax”, but spent the rest of the interview making the case for one. 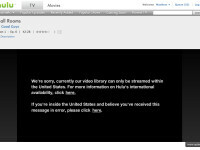 The discussion featured speaking points that seemed to contradict the no Netflix tax approach, emphasizing that everything is on the policy table and that the government is looking at all scenarios. Solomon noted the inconsistency of the comments and Joly struggled to respond.